Where I read and review Dark Fiction, from the classics to the contemporary, while favoring the quietly atmospheric, with side trips into everything from Fantasy and Mystery to the occasional work of non-fiction. This creature feature novel should come with an extra large bucket of popcorn....recalling the Saturday afternoon monster movies of my youth, with a healthy dash of "Die Hard" style mayhem thrown in. Pure, escapist fun. 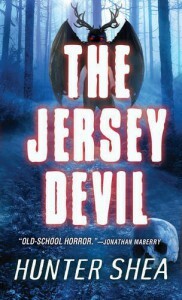 When the legendary Jersey Devil returns to it's old stomping grounds, the Pine Barrens of New Jersey, all Hell breaks loose, as the once elusive creature is now hunting....and it may not be alone. Only the Willet clan, all four generations of them, dare to challenge the Devil's reign of terror, to end a family curse. And the Willets are ready for war. Joined by a cryptozoologist, they head into the Pine Barrens armed to the teeth to face a legend. And that may just be exactly where it wants them. Hunter Shea brings his own spin to the Beast of the Barrens, expanding on the original legend with terrifying results, while peopling his novel with characters that are truly characters. Non-stop, fast paced fun from the first page to the last. This was an eArc from Netgalley.